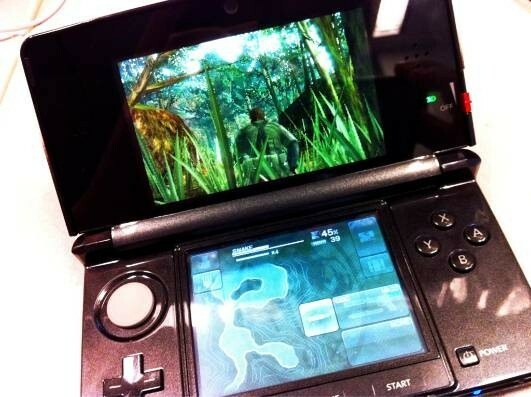 Hideo Kojima has released a sneaky snap of Metal Gear Solid being played on a Nintnedo 3DS and this time we get to see the lower screen being used to change weapons and as a general interface into the system. He has also mentioned that he used the inbuilt gyro controls to get across a suspension bridge so we can tick the movement gimmick box for this title. Personally I couldn’t be less excited about this if I tried, I’ve never liked the Metal Gear Series and to now have it on handhelds with tacked on 3D and gimmicky movement puzzles is enough for me to give this one a skip entirely. But it’s a massive series with a huge following so I think I’m in the minority here.